Winter winds are on the horizon, and with freezing weather and storms come many discussions about how to keep warm, safe, and dry. Our pets need to be included in these discussions too, whether they are indoors or outdoor pets. A common misconception is that a pet’s coat will keep them warm enough to brave winter weather. But in truth, fur is not adequate protection from winter cold, wind, and wet. Animals are just as likely to get hypothermia and frostbite as their owners. Luckily, with a few tips and some knowledge, you can help with keeping your pet warm this winter season. In fact, many of the same safety measures you take for yourself will also keep your best friend safe and warm. Limit time outdoors – no pet is equipped to spend large amounts of time outdoors in winter. Ears and paws are exposed and not covered with protective fur. You may need to even limit walks depending on your dog’s health, age, and mobility. Dress for success – short haired dogs, older pets, and the very young need extra help when there’s a chill in the air. 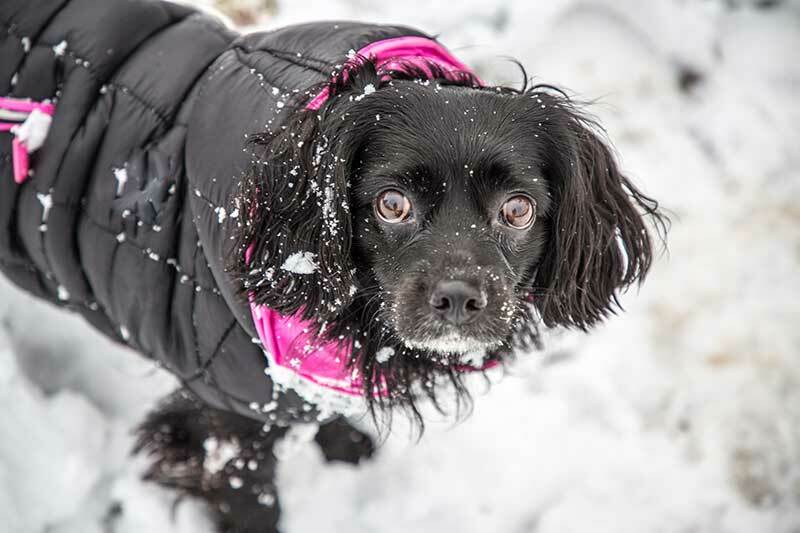 A sweater or dog coat can help your pet brave the cold and keep her warm and dry on walks and potty breaks. Even indoors, some pets can still benefit from an extra layer of “clothing”. Protein and calories – it may be that your pet needs extra protein and/ or extra calories to help keep warm in winter. Talk to The Pet Experts at Wheaton Animal Hospital about your pet’s nutrition needs in the winter, and whether or not this applies to her. As always, provide plenty of fresh, cool water to keep her well hydrated. Protect against the elements – experts agree that for keeping your pet warm if he’s outdoors, you must make sure he has a warm, dry shelter. The floor should be up off the ground and there should be some kind of insulation inside to keep it warm – such as straw or cedar shavings. The doorway should be covered with canvas or plastic. Consider talking to your contractor about heating, and make sure that your dog’s water bowl is not frozen over so he always has access to fresh water to drink. Talk to us about extra food to help your outdoor dog stay warm. Skip the haircut – dogs should never be shaved to the skin in winter. You may need to trim foot hair, however. The long hairs between some dog’s toes can pick up ice, snow, and even chemicals used for deicing (which can be toxic to pets if licked off and ingested). Outdoor kitties and feral cats – although they may be more acclimated to outdoor living – still need access to warm shelter in the winter. Keep in mind that they may seek shelter next to a warm car engine. Before you start your car, honk your horn and check under the hood for wayward (and unwilling!) travelers. Many neighborhood and outdoor cats will happily shelter in a barn, shed, or garage. If you don’t have any of these, you can also make a simple DIY shelter for community cats (neighborhood feral cats) from a Styrofoam cooler, plastic sheeting, and Gorilla tape. If you have any questions about keeping your pet warm in winter, or have any concerns about this, please give us a call. We’re here to help!